Spring has surely sprung and this year it sprung quite early!!! I just LOVE this time of year. Spring is my favourite season of all time (apart from summer of course). The beautiful clear skies, longer days, sunshine and flowers that bring lots and lots of colour! It’s the time of the year where we can pack away our jackets and scarves and start to show the world our skin again. It’s the time of year where we come out of hibernation and get ready for the festive season!! Well I’m almost ready to think about Christmas! It’s VERY early for me to say that, but because we have been spoilt with spring spilling over into winter, I started on my ‘spring to do list’ early! (Apart of me wants to see the back end of this horrid year too). Since the beginning of August I’ve been cleaning, sorting and redecorating each section of my house. Where I would normally be only just starting my ‘spring cleaning’, I have almost finished! It’s funny how once the temperature rises, after have a few months of the cold, our bodies go into cleaning overdrive – well mine does anyway lol! *Cleaned the windows and normally would clean the blinds but this year we installed new ones on all the windows. *Scrubbed my kitchen cupboards, particularly the kick boards. *Tidied up areas of the house (inside and outside) that were accumulating piles of nothing so that everything now has a place! *Sort the kids clothes ready for the new season. *And my husband needs to gurney out the front and back of the house! 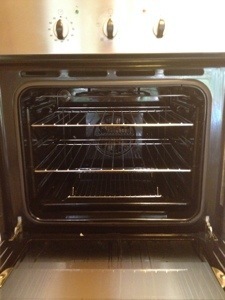 My nice organised clean fridge and freezer and sparking clean oven!! 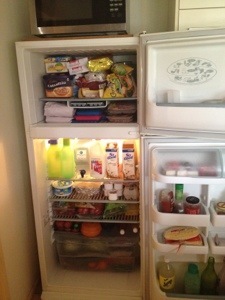 It’s a great feeling when your house has had a once over!!! 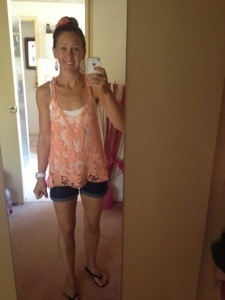 I love spring fashion! The weather allows us to wear a mix of our winter and summer wardrobe and it’s the time of year where you can wear all your brights and bring out your flowers to accessorise. 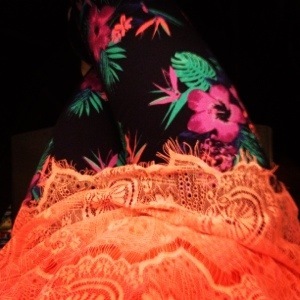 My favourite two colours at the moment are yellow and coral…I can’t get enough of them. Whether it be clothes or accessories they are the first two colours I go for! These two colours certainly brighten up my day! Aside from my spring cleaning frenzy and my love of spring fashion, spring allows us to spend our days outside soaking up the beautiful weather together, while creating more wonderful memories. 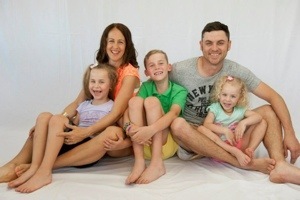 And what better way to have the kids home for the school holidays!! We have so many fun things planned that include play dates at playgrounds, the local pool and the beach! 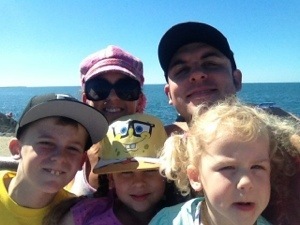 Taken on our first trip down at Wynnum this season…so many outings to look forward to!! I’m hoping now we’ve venture into a new season things will start to feel happier for our family. We sure had a terrible winter with my beautiful nana passing away on June 1st. Now the flowers are blooming and there are more butterflies than ever, we can find some comfort in knowing Nana will be around everywhere! 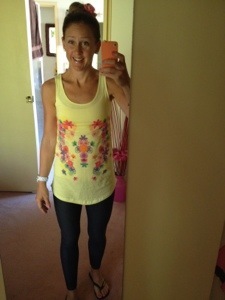 Fluro and floral…yep it’s spring time!!! Keep an eye out later in the week for my post on ‘A Freshen Up’…a look inside my home at my new decorating pieces!